Really smashing to see all the new faces & talent in the photo below, as our fave swim Bears welcome their froski sissies to the fold - swim on you Bears! Cal W Swim & Dive: If it's August, it must be time for the Welcome Back BBQ. Thank you to @TheBigCSociety for sponsoring! 3rd row: Billy, Dannie, Ali, Jenna, Alexa B. Found! (well, some of them ): Keaton, Maddie, Kathleen, Maija...housemates? 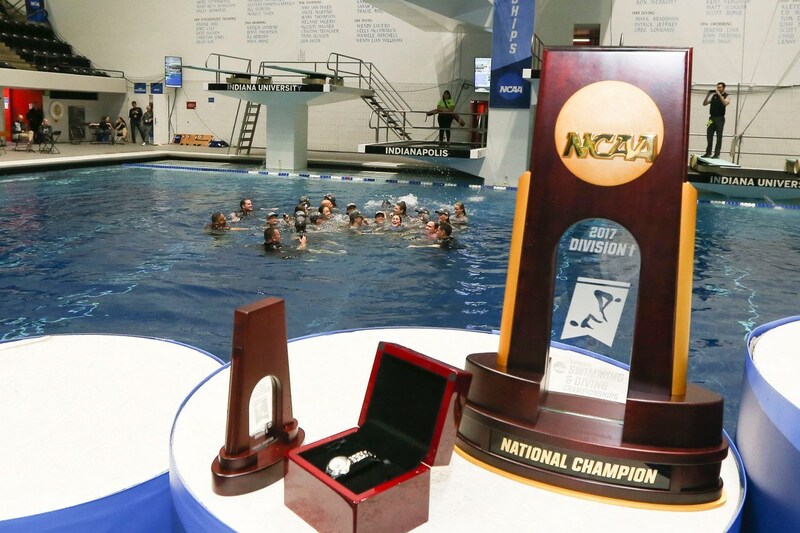 I'm sharing some statistics from the 2013 through 2016 NCAA Division I Women's Swimming and Diving Championships, in hopes that we'll gain some insight into how a title-winning team is constructed. The basic facts are that 4,030 points are available for distribution throughout the meet. A finals placings are awarded as follows: 20-17-16-15-14-13-12-11. B finals placings are awarded as follows: 9-7-6-5-4-3-2-1. Relays are scored double. The winning team scored an average of 476 points. Of these, 314 points are individual and 162 points are relay. 12 scorers contributed to this total. The second place team scored an average of 410 points. Of these, 252 points are individual and 158 points are relay. 10 scorers contributed to this total. Although the women's team is allowed a maximum of 14 scholarships, only Georgia in 2013-2015 and Cal in 2014-2015 essentially maxed out their rosters. Otherwise, the top 3 teams brought ~13 swimmers and divers to the championship. 11 scorers contributed 328 individual points and 186 relay points. 6 (Franklin, Runge, Pelton, Osman, Klaren, Bootsma) contributed the equivalent of 3 A final placings, for a total of 253 points. 1 (Li) contributed the equivalent of 2 A final placings, for a total of 20 points. 11 scorers contributed a total of 233 individual points. Georgia has scored a little over 300 individual swimming points in 2013-2015, but was boosted by 56 diving points in 2014. Stanford has progressively scored more points on diving from 2014 to 2015 to 2016, with 56 diving points in 2016. Naturally, the more swimmers that move up in categories, the better! We should also aim for at least top-3 finishes in every relay, with a couple of wins. Feel free to chime in with your thoughts (or suggestions on additional stats to analyze). Thanks for formally crunching the numbers. My only quibble would be that an NCAA championship team doesn't have to outscore other championship teams, they just have to outscore the second place team. Potential champion doesn't necessarily have to score 480; 420 would get it done on average. Ballpark, Teri needs to build a team that scores between 420 and 480 points irrespective of how the points are generated. Ideally would be 17 swim scorers (an A & B scorer in each event) and two scoring divers, but the mix really doesn't matter. Get in that range and tip your hat if somebody beats you. Missy's title team win was especially sweet since Georgia scored 452 points and still lost. With the new season underway, top times lists turn over meaning you have to look back / look forward to getting a sense of what the season looks like. Here's a quick and definitely unofficial look at the returning/incoming Top 50 look like. Stanford leads the way with seven swimmers ranked in the top eight in fifteen different events. 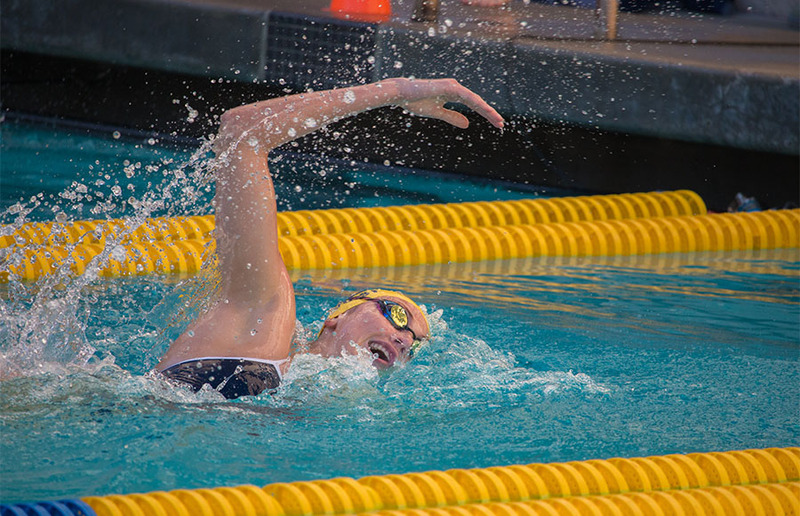 Cal features four swimmers ranked in the top eight across ten different events. 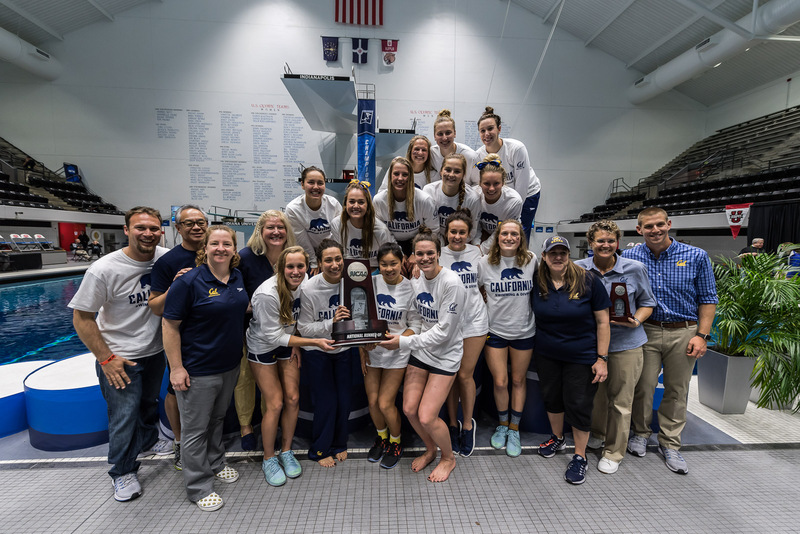 Armed with the data-centric info in the above quoted posts from Oct 2016 (a special thanks goes out to beaverbear & BearDevil), let's look at SwimSwam's preview of the Top 12 women's programmes from the 2017 NCAA Championships. Note that the ranking here doesn't actually denote predicted order of finish @ 2018 NCAAs - that will come later, starting this autumn with their ongoing "power ranking" series of articles. This is merely where the respective teams stood at the conclusion of last season's 2017 NCAA Champs. The inaugural PAC-12 VS. USA SWIM CHALLENGE will take place somewhere in LA/SoCal the weekend of 21-22 Oct, which more than a few of our Bears will surely be invited to. With the NCAA season rapidly approaching, we decided to come up with our own preseason NCAA Division I Top 25 rankings. Next, we will release the women's rankings -- five teams per day. If any team can be led by depth in the distance events, it's Michigan. The Wolverines have four swimmers in preseason scoring position in the 500 with G Ryan, Yirong Bi, and Becca Postoll and two in the 1650 with Ryan and Bi. Only top-ranked Stanford can produce similar numbers. Across the board, Michigan is solid and junior Siobhan Haughey will be battling for a top-three finish in the 200 freestyle and championship final spot in the 100. UM also returns additional NCAA scorers (individual and relay) Gabby Deloof, Catie Deloof, Clara Smiddy, Emily Kopas, and Vanessa Krause. Three top 25 recruits chose Ann Arbor for their college destination including distance star, and avid behind-the-blocks dancer, Sierra Schmidt. In a conference where the main storyline will still be Indiana's Lilly King, Michigan will be on the move. Despite a ninth-place finish last year, Dave Salo and the Trojans return a fast group of women for the upcoming season. Plus they have added the versatility of Maggie Aroesty, a 58.9 100 breaststroker who can also turn a 4:10 400 IM. She is ranked third among incoming recruits. Louise Hansson, Maddie Wright, and Riley Scott are all entering the year with top 10 times and a handful of their teammates aren't far behind. The Trojans' other returning scorers (individual and relay) include: Kirsten Vose, Tatum Wade, Becca Mann, Hanni Leach, and Maddie Wright. Even with Stanzi Moseley transferring to Tennessee, USC is a big mover this preseason. Stanford wasn't alone in sending a large contingent to Budapest for the 2017 FINA World Championships. Texas A&M did as well. 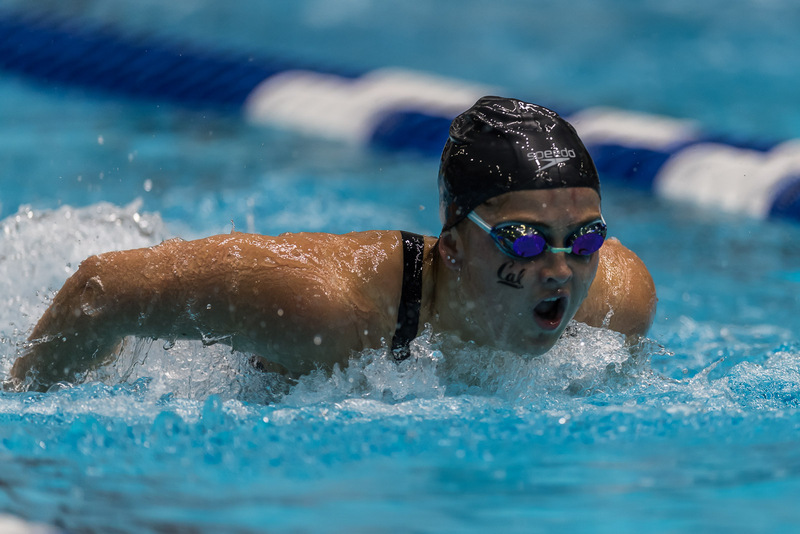 IMer Sydney Pickrem, who represented Canada at Worlds, and breaststroker Bethany Galat, who represented the USA, are both returning for the Aggies following successful summer performances. The loss of versatile butterflier/freestyler Sarah Gibson leaves a bit of a hole, but A&M is still in the thick of things for a top three finish at NCAAs. 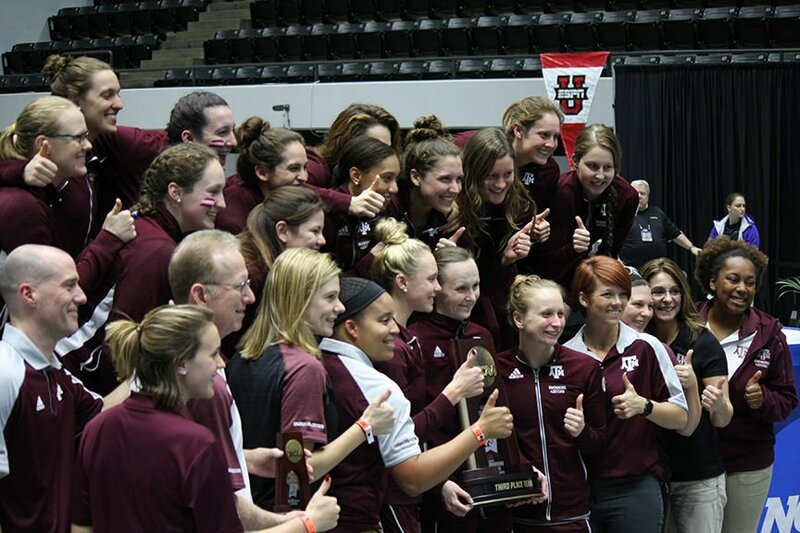 A combination of world-class talent and depth, specifically in breaststroke, make up the Aggies' identity. As far as relays go, the medley relays are in good shape, but gains can be made by sliding up in the freestyle. From a recruiting standpoint, TAMU head coach Steve Bultman corralled a massive star in Anna Belousova -- a 1:00/2:10 breaststroker who will make an immediate impact. Taylor Pike, a 53.3/1:54 butterflier, will do her best to mitigate the loss of Gibson in those events. The Bears came second to their Bay-Area rivals last year, and that is where they will start this year. With another strong summer under her belt, junior-to-be Kathleen Baker is poised for another 200 IM-100 back-200 back sweep. Cal's 200 relays are the team's backbone. The Bears return all but Farida Osman from last year's victories, and it will take adding senior Valerie Hull to the free relay and Maddie Murphy to the medley to repeat. Another swimmer to keep in mind is Abbey Weitzeil, who competed in the 2016 Olympic Games and 2017 World Championships for Team USA. While she struggled (relatively speaking, of course) at NCAAs last season as a freshman, Weitzeil will almost certainly reverse that result in 2018. Aside from those stars, Teri McKeever is a returning scorer (individual and relay) with Amy Bilquist, Katie McLaughlin, and Noemie Thomas. In addition, the Bears picked up some international depth with incoming freshmen Sarah Darcel of Canada and Robin Neumann from the Netherlands. Darcel -- who has not competed in SCY -- is a stud 2:13/4:39 LCM IMer who can swim a swift 100/200 fly and 100/200 breast as well. 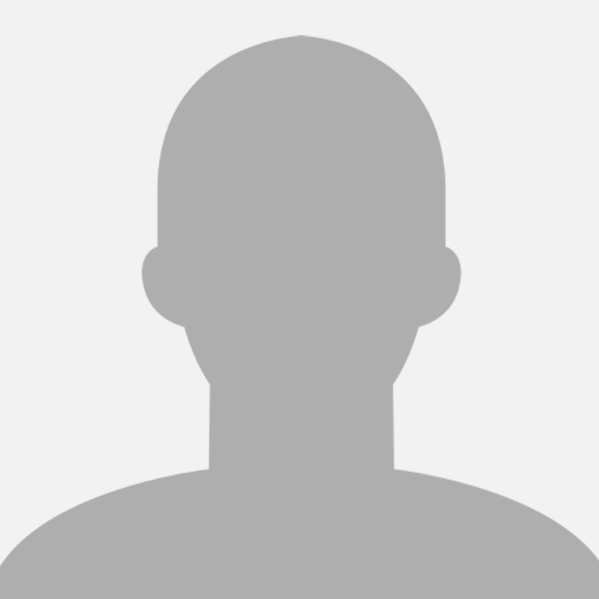 Neumann, like Darcel, has not competed in SCY. However, she has a 55.0 100m free and 1:57 200m free to her name. Those performances come with massive relay implications. No surprises here. Stanford returns the fastest swimmer in an astonishing seven events. That's right, Greg Meehan and the Cardinal return the top swimmer in the 50-100-200-500-1650 freestyle, 400 IM, and 200 butterfly, led by Simone Manuel, Katie Ledecky, and Ella Eastin. Instead of going through the long list of returning scorers, we will instead give you the short list of scoring losses -- Lia Neal and Nicole Stafford. Neal is a big loss, as she was a mainstay on many of the Cardinal relays plus a big scorer in the 50 and 100 free. Stafford scored by finishing 16th in the 200 freestyle. In the "offseason," the Cardinal added three top 10 recruits, highlighted by Brooke Forde. A 400 IM specialist, Forde can literally swim anything and will be the ultimate Swiss Army knife for Meehan and company. Joining Forde are Hannah Kukurugya -- another elite jack of all trades -- and Lauren Pitzer, a 22/48/1:45/4:42 freestyler who can make an immediate impact on relays. Not to be forgotten, Meehan also reloaded with a 1:00/2:09 breaststroker in Grace Zhao. There is no doubt this title is Stanford's to lose. Clearly, this is a conspiracy since ISI Photos is based in Palo Alto. 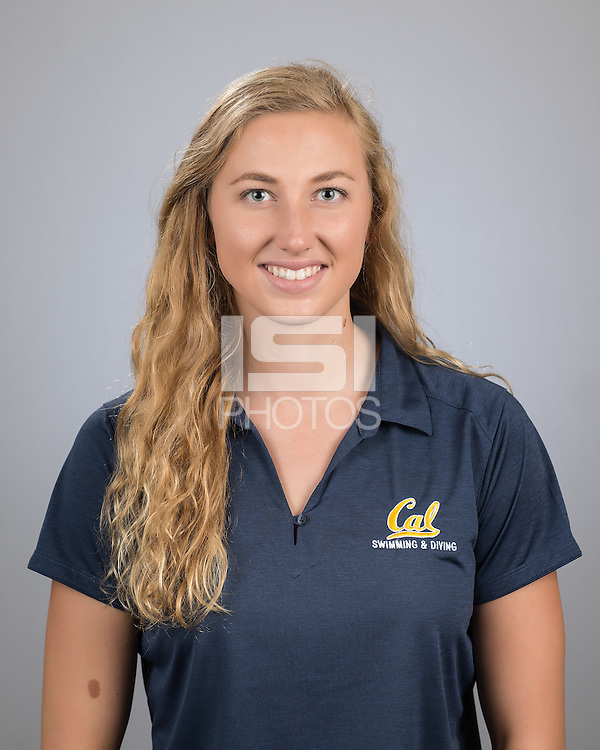 Last year's photography studio, Golden Bear Sports, is based in Berkeley and took superior photos, right? BERKELEY - Whether it was in the water or on the pitch, Cal student-athletes upheld a tradition of national championship excellence throughout the 2016-17 season. To celebrate those accomplishments, the Golden Bears are holding their annual National Championship Week Sept. 4-9, culminating with an introduction on the field during the Cal-Weber State football game. 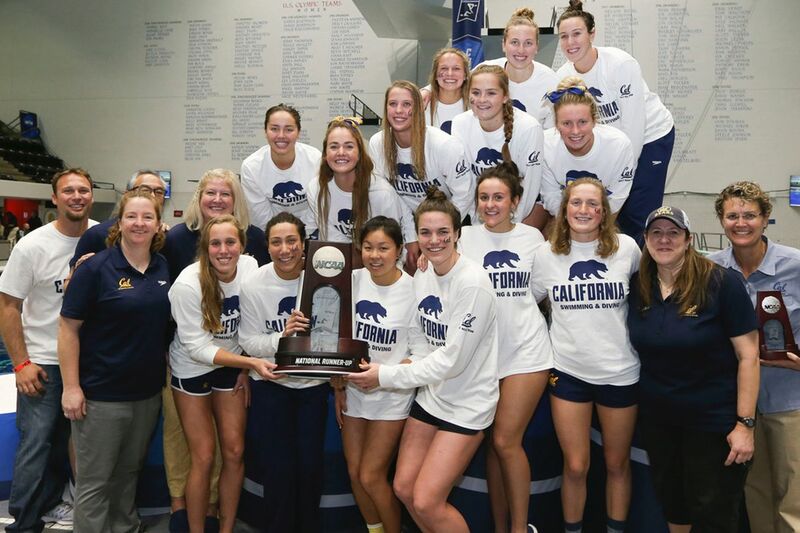 Altogether, Golden Bears have made a home in the water with the bulk of last season's titles coming from Cal's renowned aquatics programs. In the pool, swimming & diving impressed from start to finish with student-athletes who were not only the best collegiately, but in the world, sporting the Blue and Gold. On the men's side, three-time Olympic gold medalist Ryan Murphy capped his undergraduate career with wins in the 100 and 200-yard backstroke at the NCAA Championships in Indianapolis. In his final trip to NCAAs, Murphy completed a career sweep of the backstroke events as the world's top backstroker became just the fourth men's swimmer in NCAA history to win both distances of one event in all four years of college. After completing another historic season, Murphy earned his third Pac-12 Swimmer of the Year award and was also named Pac-12 Scholar-Athlete of the Year for men's swimming. His efforts in Indianapolis brought to a close one of the most prolific careers, both in the pool and in the classroom, in Cal Athletics history. 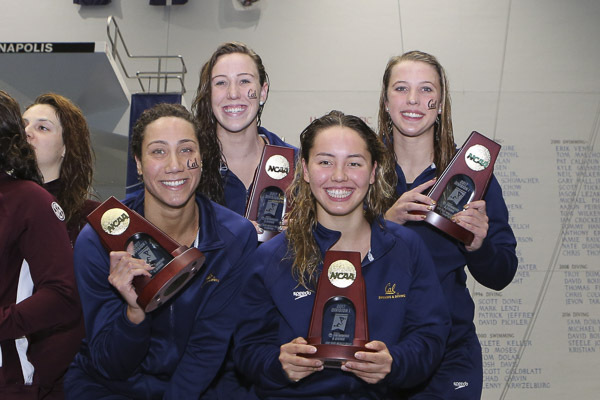 On the women's side, Cal's national title count increased with four individual and two relay titles. Kathleen Baker won three events the 100-yardbackstroke, the 200-yard backstroke and the 200-yard individual medley setting a pair of school records while senior Farida Osman captured the 100-yard butterfly in a lifetime-best performance. Baker was named the 2017 CSCAA National Swimmer of the Year, becoming the sixth Bear and fourth in the last six years to claim the honor. As a team, the women also stroked their way into a pair of relay titles with NCAA and U.S. Open record-setting performances as Baker, Abbey Weitzeil, Noemie Thomas and Osman won the 200 medley relay. Amy Bilquist and Valerie Hull also helped propel the Bears to the top, combing their efforts with Weitzeil and Thomas during prelims. 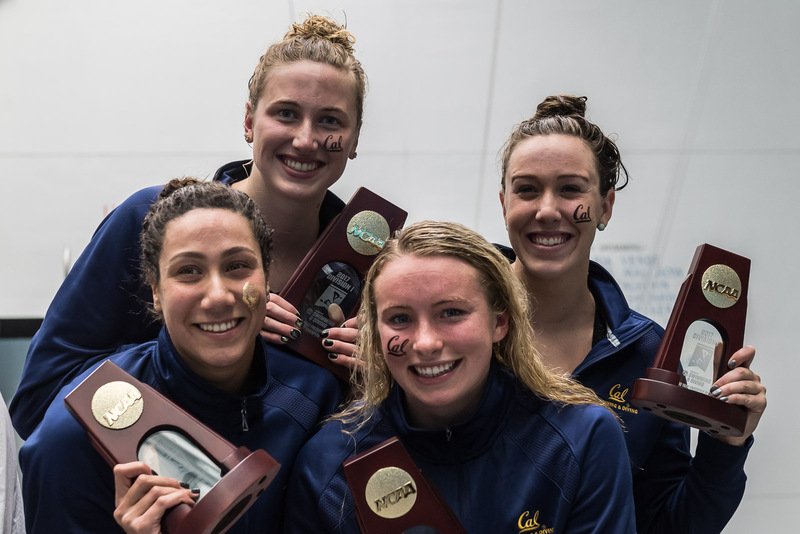 Another Cal foursome Weitzeil, Maddie Murphy, Bilquist and Osman captured a third consecutive title for the Bears in the 200 free relay, with Valerie Hull and Kristen Vredeveld contributing in morning qualifying. ...Amy not in this group photo? Coming into her freshman year, Cal's Abbey Weitzeil was expected to set the pool ablaze. She was a 2016 U.S. Olympian and the American-record holder in the 50 freestyle (still is) with a 21.12 and her 46.29 was a U.S. record before Simone Manuel lowered it a few times times to its current 45.56. However, Weitzeil struggled to meet her best times during her first year in Berkeley. Even though she had a rough ride -- relatively speaking, of course -- Weitzeil still amassed significant points for the Golden Bears at NCAAs, making two championship finals and contributing to just about every relay she could possibly swim. If the sophomore can get back to top form in 2017-18, she will be scary fast and a serious threat on all cylinders come March. Maddie Murphy was an unsung hero for the Golden Bears last season -- picking up major points in the 50 freestyle and 100 butterfly, along with the NCAA record-breaking 200 freestyle relay. With Farida Osman exhausting her eligibility, Murphy will likely be a new addition to both medley relays as well -- solidifying her value for Teri McKeever and Cal. If she can bring her 100 down to the 47 mid-low range, she will be truly dangerous at NCAAs in March. 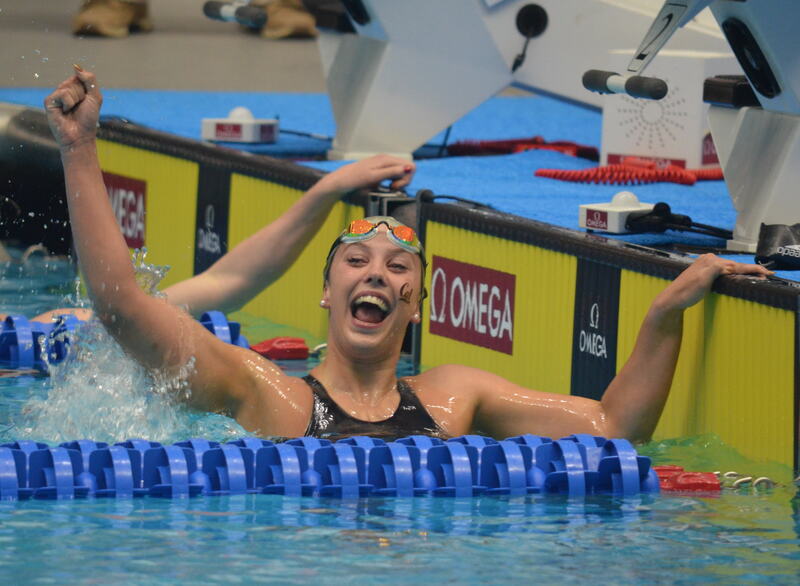 Kathleen Baker's value for Cal is immense. I mean, she did sweep all three of her individual events last season. That's pretty good, right? But Baker is not on an island -- she contributed greatly to 4 of 5 Golden Bear relays as well. 800 freestyle relay? 1:42.66 leadoff for second place. 400 freestyle relay? 47.72 split for third place. 200 medley relay? 23.62 leadoff for first place. 400 medley relay? 49.80 on the leadoff -- touched first but eventually disqualified for an early Abbey Weitzeil takeoff on the anchor leg. Just like Manuel for Stanford, Baker does it all and will again need to rack up a significant amount of points at NCAAs this season if Cal wants a shot at dethroning Stanford in March. Butterfly specialist Noemie Thomas has been a focal point for the Cal Bears throughout her career. Thomas is the third fastest returner in the 100 butterfly -- an event where multiple swimmers are flirting around the 50 point low to mid range. As a matter of fact, Thomas was the top seed out of prelims a year ago before slipping to 5th in finals. Regardless, the Canadian senior will almost certainly be in both championship finals and top three finishing medley relays as well -- racking up significant points for Teri McKeever's squad. With Farida Osman exhausting her eligibility, Thomas could even sneak onto Cal's freestyle relays as well -- making her that much more valuable in the team fight with Stanford. This one was pretty tough -- on the bookends at least. Missy Franklin was practically interchangeable and could swim both legs. However, the differential between Kathleen Baker's 1:48.44 in the 200 back and Franklin's 1:47.91 was less than the differential between Katie Ledecky/Mallory Comerford's 1:40.36 in the 200 free and Franklin's 1:39.10. Therefore, we made a judgement call and threw Missy on the anchor. While maybe not as impressive as the men's relay below, the women's dream team is still dominant. This relay would take down some lower-tier Power Five programs in the 800 freestyle relay and, if you factor in relay exchanges, could have beaten the times posted last season by Ohio University, Iowa State, Southern Illinois, and West Virginia. Now, all things are not constant when comparing apples and oranges. But still, it is a very impressive reference point -- 10/10 would pay money to watch that relay compete. It's blatant disrespect not to mention Teri McKeever's Cal squad. 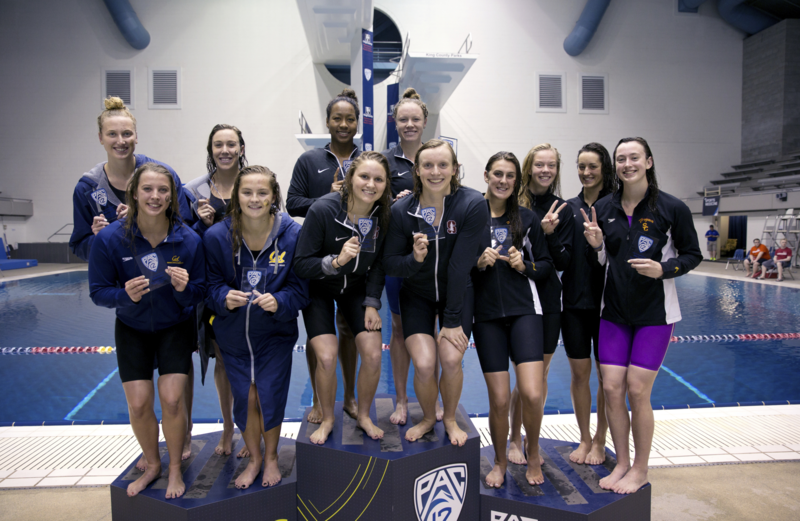 The Golden Bears, led by Kathleen Baker and Abbey Weitzeil, are a formidable team that will give the Cardinal more than they care to handle come championship season. Put this in perspective: not only did Stanford and Cal go 1-2 at Pac-12s last season, but they also went 1-2 at NCAAs. That is how dominant these two programs are on the national scene. Welcome back to the pool, "Momma Bear"!!! Got a chance to take a glance at the froski bios now that the roster is finally up. Know that we had in the past talked about freshies Aislinn & Courtney as being legacies, but hadn't realised how impressively deep these ties were (parents & relatives not just having attended school here, but some of them were also student-athletes repping Cal) ... or that Maddie & Mia were legacies too! Note to tedbear: "Where's Amy??!" ("Colorado!") ... "And why does Abbey look almost as tall as Val here? Inquiring minds want to know!" 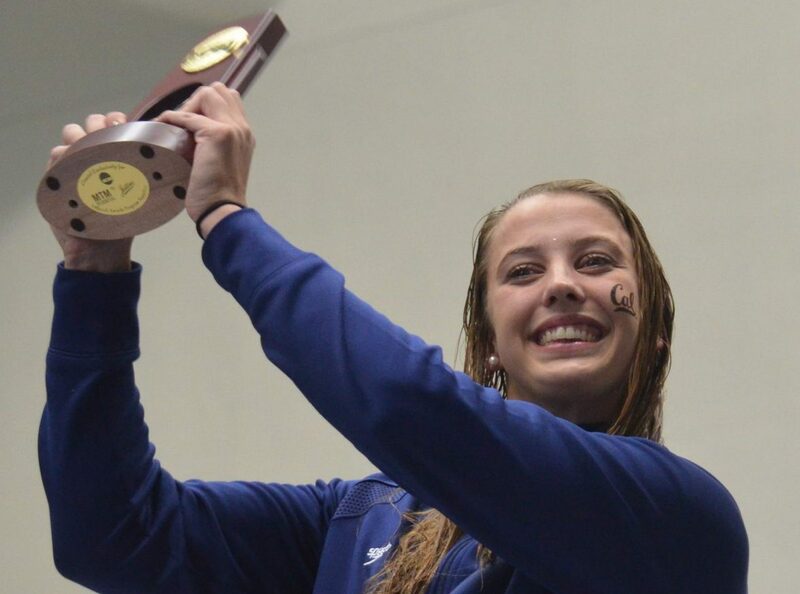 She doesn't get the same hype as Katie Ledecky or Simone Manuel, but Cal junior-to-be Kathleen Baker was the CSCAA National Swimmer of the Year last season ahead of both of them. She won 3 events at NCAA Championships, and already holds the school record in the 100 back (cc: Coughlin, Franklin, Pelton, Bootsma, etc.). In Cal's illustrious history, only Natalie Coughlin (11) has won more than 7 individual NCAA event titles. Baker could get to 6 this year and set herself up for history in 2019. In March of 2015, in just her senior year of high school, Abbey Weitzeil swam the fastest 50 yard free in history by a woman. She clocked 21.12 at the American Short Course Championships, knocking a full 0.15 off of the previous record. 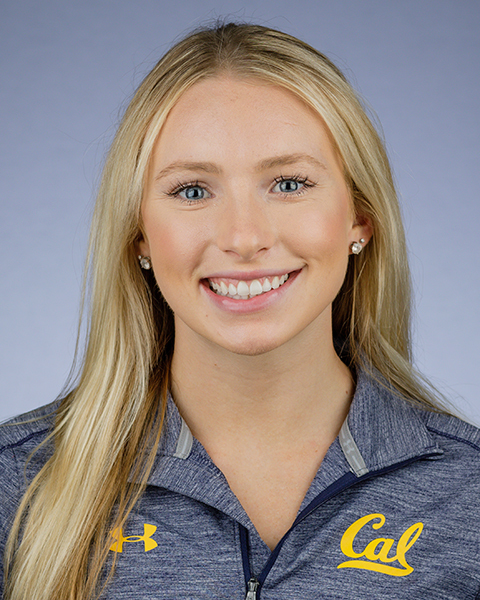 Already committed to swim for Cal the following season, she announced later that month that she had decided to defer her freshman year in order to prepare for the Olympics. That moved ended up to be a smart one. She won both the 50 and 100 free at the Olympic Trials, and went on to make the Olympic final in the 100 and pick up a pair of relay medals. However, her first season with the Golden Bears was a rough one by her own admission. She still had some decent swims at her first NCAAs, finishing 5th in the 50 and putting together some key relay legs, but overall it wasn't up to her lofty standards. Now with freshman year behind her, what does this season have in store for the Canyons Aquatic Club alum? For one, she has a legitimate shot at Simone Manuel in the 50 free. Manuel did go 21.17 to win last season, but Weitzeil has been faster. She wasn't bad last year, going 21.5 for 5th, but should be able to get back in the 21-low range in 2018. We should also see a big improvement in her 100 free. She finished 8th in a time of 47.79 in March, but was able to uncork a 45.96 relay leg the night prior in the 400 medley (albeit with a -0.13 reaction, which got the team disqualified and stripped of the title). She's been as fast as 46.29 flat start, and while Manuel may be too far ahead in this event, she should be able to challenge Mallory Comerford for the runner-up slot. Though she still wasn't on top form this summer, getting herself on the World Championship team was a definite confidence booster heading into this season. One of the most exciting things to look forward to in an NCAA season is who's gone, who's new, and which national titles will be up for grabs once March rolls around. However, the women's side could lack that type of drama this year. Out of 13 individual swimming events, only one won't feature the defending champion. And out of the remaining 12, ten of the events have a defending champ who is an individual Olympic medalist. The women's 100 fly is the lone event which won't feature the defending champion, as Cal's Farida Osman has graduated, but other than that it doesn't look like there will be a lot of turnover at the top. Kathleen Baker has a stranglehold on back. And then there's the 200 IM, where Baker and Eastin will throw down for the second straight year. 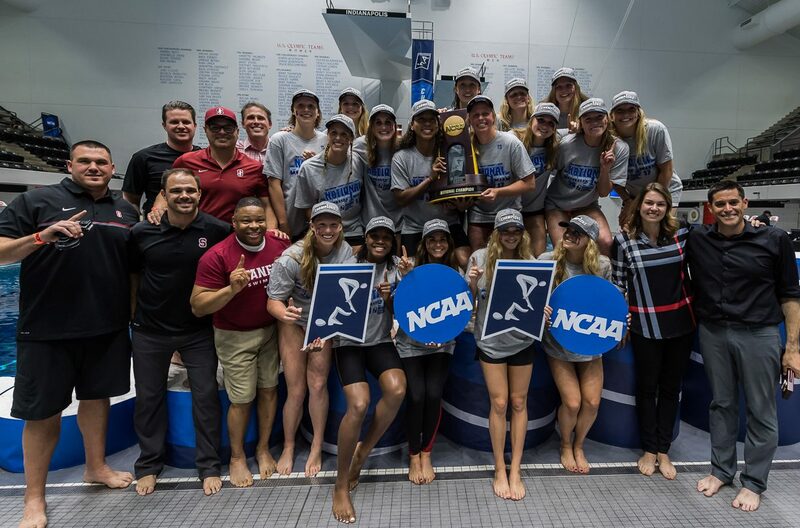 After winning the NCAA title by a whopping 160.5 points last season, the Stanford Cardinal women project to be dominant once again. They've lost Lia Neal, who was an integral piece to their puzzle, but bringing in the #1 ranked recruit class in the nation certainly softens the blow. there will be no stopping the Cardinal this year. They should win back-to-back NCAA titles for the first time since 1995-96, and could improve on their 160.5 point margin of victory, which was the largest since Auburn defeated Georgia by 163 in 2003. Well amongst the usual SwimSwam trollish rubbish in the comments section, here's a sobering take...just remember though, THE BEAR WILL NOT QUIT! SWAMFAN commented: "Out of the past 4 recruiting cycles, Stanford has had by far the #1 recruiting class in 3 out 4 years. All four of those stellar recruiting classes will be competing at NCAAs this year and I'm almost scared of what the Stanford team can do to their competition. Their utter dominance at 2017 NCCAs (winning by 160.5 points) is even more unbelievable when you consider how many of their swimmers arguably underperformed at the meet (eg: Drabot, Engel, Howe, Szekely, Voss.) It's not often that a team has enough talent to dominate NCAAs even with a third of their team being "off" at the meet. If all or most of Stanford's swimmers have a fantastic meet at 2018 NCAAs, the results could be absolutely devastating for the other teams. (The results will likely be devastating even if only half of their swimmers have a fantastic meet.)" - Interesting addition of a dual v. NC State on 4 Nov (Wolfpack goes up against the furdettes the day before). What's more, this meet will go down @ Legends instead of Spieker...just hope there'll be adequate seating! - Also competing @ the Fresno State Invite early Oct, against the likes of the hosts Fresno State + San Jose State, San Diego State & Nevada. 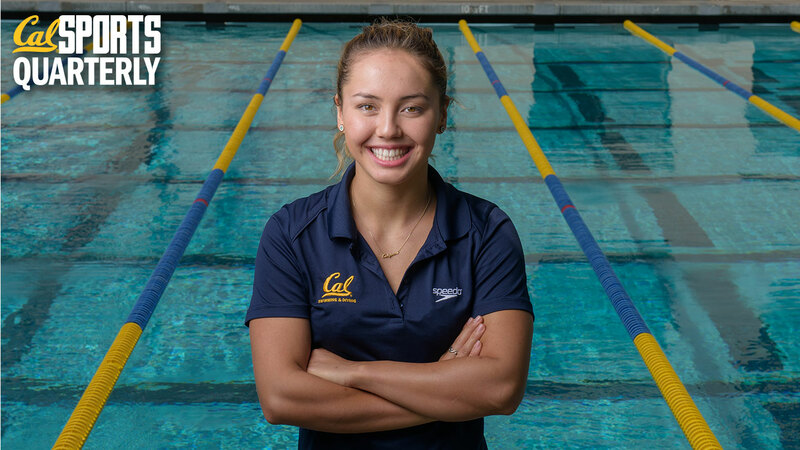 - Home dual v. Nevada on 17 Nov.
Melanie Klaren, a former All-American and 2x Captain for the Cal Golden Bears, will be joining the Reno Aquatic Club as a coach this fall. Klaren, a backstroke and freestyle specialist from Laguna Niguel, California, comes to Reno from a year with Duke University as a Volunteer Assistant Coach for the 2016-17 season. The year saw both the Duke men's and women's programs score at the NCAA Championships. At any rate, hope that Bilquist has her stress fractures injury relatively managed & under control this season, so that she can go on to finally bust out the sort of performance @ the big dance that she had always so tantalisingly teased us with! Also would like to extend an official welcome to Maggie Gallagher who hung out with the dive team last season but didn't compete AFAIK - she is now listed as a "redshirt freshman". Welcome back (home), Sara ... and very luvly to see Milt Nelms working our women hard! Who are the Top 25 Women's Swimmers in the 2017-2018 NCAA Season? 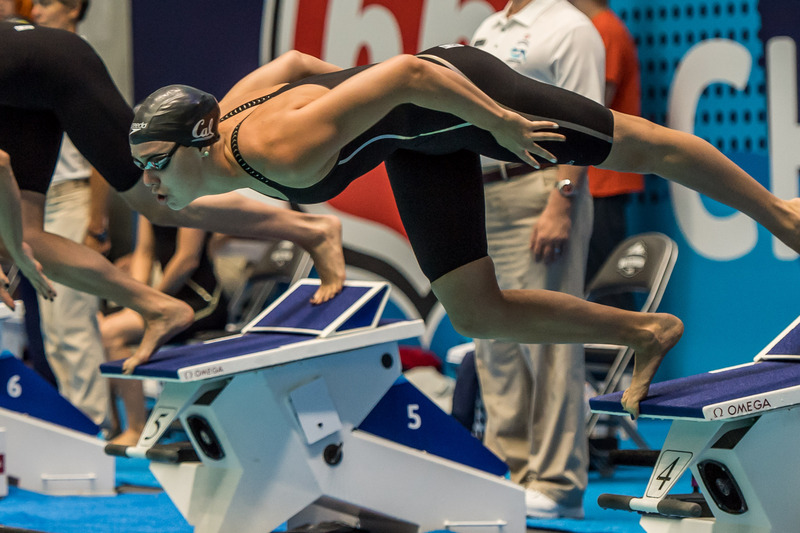 Thomas returns for her senior year as a contender for a butterfly national title. Thomas has yet to win an individual title as she has won multiple relay NCAA titles in her career. The 100 seems to be her best chance as she has the third fastest time into this season. The 2016 Olympian and 2017 World Championship team member had a relatively disappointing freshman campaign in Berkeley. Her sophomore year won't be very forgiving as she still will have to face one of the most stacked sprint fields in NCAA history including Simone Manuel, Mallory Comerford and Liz Li. Bilquist is a part of a deep Cal team that will need every ounce out of her if they want to catch Stanford. Bilquist was third and fourth in the 100 and 200 back at the 2016 Olympic Trials and will be looking to get back to that level in her junior season in Berkeley. McLaughlin hasn't been quite the same since injuring her neck her freshman season. She seems to have moved more focus to middle distance freestyle, but she is still a formidable 200 butterflyer and could potentially win her first title in that event in 2018. 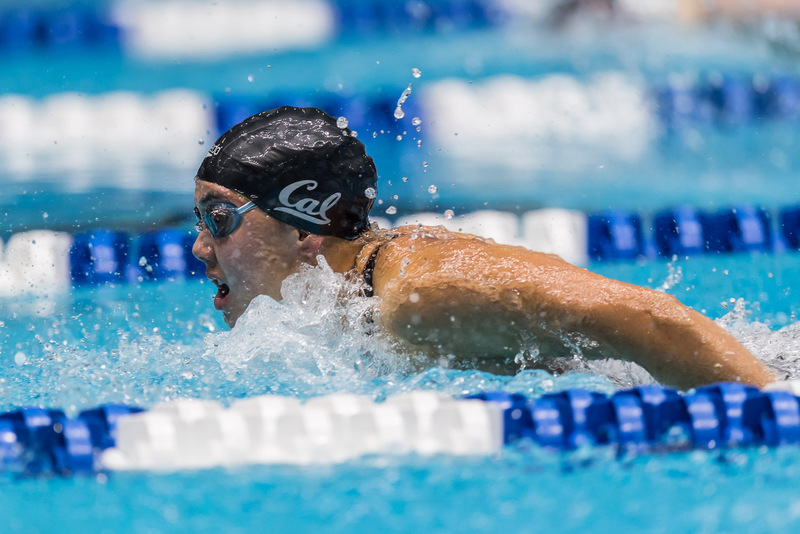 The reigning NCAA swimmer of the year had a huge sophomore season where she won three individual titles and one relay title for the Golden Bears. Baker won silver and bronze in the 100 and 200 back at the Worlds in Budapest so she should have the confidence to defend all three titles in 2018. Not surprised that Ali has sneaked under most people's radar, just as with Madds last year (zero mention in the article below). Which is sort of to our advantage as will take some pressure off Harrison in terms of expectations & pressure. As I've opined on multiple occasions, Ali has considerable upside in her breast (not too shabby in her 50 free either), and with a bit further development in her sprint breast, could realistically slot into the breast leg of our 200 medley relay, thus freeing Abbey to take over the anchor free spot with Farida's graduation. As for the longer medley relay, Ali could vie for the breast position along with Sarah & Dannie - not to discount Maija who's another viable option, esp if she can, in her last season of eligibility, impressively drop the sort of time that she did @ 2017 Pac-12s, though Roses has historically been more distance-oriented. If it weren't for Stanford, maybe it would be the talent on Cal's roster causing swim fans to worry that the entire NCAA will pack it up and sit out the season in a protest for parity. (No joke, that worry has actually been stated in our comment section). Abbey Weitzeil scored 25 individual NCAA points without even scratching the surface of her potential. Kathleen Baker is approaching international icon status after silver medals in Rio and Budapest. Maddie Murphy turned out to be a diamond in the rough as a rookie. Getting Katie McLaughlin and Amy Bilquist back to full strength would put this team into scary territory. It's an international-heavy recruiting class, but Robin Neumann (Netherlands) and Sarah Darcel (Canada) look like big gets. Was there ever any doubt? Ella Eastin and Simone Manuel are proving a cut above anyone else in their events. Katie Ledecky is Katie Ledecky. Ally Howe and Janet Hu were some of the NCAA's highest scorers without even having their best times at nationals. Add in a recruiting class that includes 5 of our top 20 recruits and you've got an easy consensus #1. Brooke Forde is probably the best incoming freshman in the nation with three NCAA scoring times. Could Grace Zhao fill the team's only true hole, breaststroke? That's basically the most burning question about this roster, and it amounts to whether Stanford is the best team in the NCAA by a lot or by a whole lot. The men will also be competing, for "King of the Pool" bragging rights - contenders = Andrew Seliskar, Matt Josa, Ryan Hoffer, Zheng, or... ? The freshman class brings in a lot of freestyle speed to a program that is already pretty loaded in the mid-distance frees, in particular. Fly and back will also be strongpoints for the Longhorn women in 2017-18. Millard will be a key senior leader this season, with Evans, Adams, Rule, and Case returning to form the foundation of the Texas team. Should Lohman fit in well and continue to hit best times, Texas could have some seriously deadly medleys, though the freshman class, as talented as they are, will have a hard time making up the holes left behind by Cox and Karosas. UGA was hit hard by stars finishing out their four seasons with the team, but there's always something in the woodwork with the 'Dawgs. They did snag the #1 ranked recruit Courtney Harnish, and the rest of the freshman class should fall into place and play a part throughout the season. Butterfly is going to be the team's strongest point, which will only be strengthened by a healthy Kingsley, if she can get there. It will be intriguing to see how the sprint free relays fall into place, but there looks to be enough talent and depth to keep UGA in the top 8 for another year that said, they need a big class to come for the 2018-19 season, or things might go south fast. Gibson's loss hurts, but the Aggies will be able to utilize the versatile Gastaldello to try to make up for lost time on relays. Her individual contributions will likely be too difficult to overcome with one single addition from the incoming class, though there is plenty of potential between Pike, Belousova, Field, Yelle, and Wen Quah to make up for it. It will be another year of IM and breaststroke dominance, but there are some obvious depth holes on the roster, particularly in backstroke and sprint freestyle. There is still enough at the top to keep relays and some individual points afloat (Gastaldello and Rasmus in the free, Gastaldello and Bratton in back), though, and the team overall is looking ahead at what should be another big year. Breaststroke and distance free continue to be weak areas for the Bears in terms of depth and NCAA scoring, but they have huge scoring potential in all other events. They may not have the depth to challenge Stanford for a title, but with their sprint talent, they should be challenging for several relay titles and should get multiple individual titles with Baker alone. It wouldn't be surprising to see Cal come away with their 10th consecutive top 3 finish. This Stanford team is loaded, and should be considered the heavy favorites to run away with the NCAA title again this year. The freshman class is more than good enough to replace Lia Neal's 31 points, though her relay contributions and overall leadership are still big losses. The Eastin-Ledecky-Manuel trio is easily the best Big Three in any NCAA swim team at the moment, and there's real potential for them to combine for up to 8 individual NCAA titles this year. Freestyle points alone should put Stanford well ahead of the pack, and the next step for this team might be attempting to challenge the highest point-scoring teams in women's NCAA history. Was thinking that it might be interesting to compare times for our women between today's "Queen of the Pool" and the last couple of year's, where applicable. The list below isn't comprehensive as I had in some instances included just the Top 10 (or fewer) Cal finishers here. Thleen Bean off to a roaring start! Abbey & Amy slower start than 2016...could be partly due to health issues, esp in Billy's case?? Too early to look at absolute times, but relative event place is usually relevant/predictive in K/Q of the Pool. Robin and Sarah are definitely talented, but SCYs is always a concern with internationals. So far, so good with both. Figured Robin was a two relay (400/800 Frees) swimmer for the 2018 Bears, but her 100 Free placee may indicate she can also contribute on the 200 Free Relay. Sarah's even more versatile than previously thought. Potentially in the mix for the breast legs on medley relays. Freeing up Abbey from the breast legs would help her and the team overall. Ali looks like a more likely breast leg on the medleys., All three (Sarah, Robin, and Ali) appear underrated with considerable upside. Ideally another froskie (Sophie?) can also step up. As you had mentioned, depending on their respective improvement curves in the course of the season, Sarah could help out on breast in our 2 medley relays with some development (esp the 400 Medley relay), along with Ali who looks to be more favoured as an immediate prospect for the 200 Medley relay. Whilst free appears to be the slightly "weaker" stroke for Sarah (hence the observation that she was always amongst the early leaders in the individual IMs @ 2017 World University Games, but the field started to catch up on her the final 50 or 100m), Darcel was actually the anchor leg for Team Canada's 4x100m Medley & 4x100m Free relays @ 2016 Junior Pan Pacs - ultimately out-touched at the final wall by 2019 recruit Isabel Ivey. Day 2 - 500 Free or 50 Free?